studied cello with Peter Mann in Berlin, and George Neikrug in Boston. master classes with Neikrug, Uzi Wiesel, Werner Thomas. joined ensemble xenon, a Berlin-based chamber ensemble for improvised and composed music. 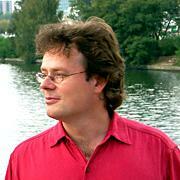 former member of the new music ensembles work in progress–Berlin and UnitedBerlin until 1998. CD productions, tour of South America, performed most of the ensemble works of the 2nd Viennese School. more than 100 solo, chamber, and ensemble WPs (Repertoire). string pedagoge, chamber music coach, workshops on contemporary music (University of the Arts Berlin, Boston University - School of Music, Conservatory Klagenfurt, Music Academies of Katowice and of Krakow, School of Music Lucerne, Conservatory Vienna, School of Music Winterthur/Zurich, Shanghai Conservatory...). Several lecture workshops at Mozarteum Salzburg in cooperation with ConTempOhr. 2009/10 Artistic Director (during the starting phase) of the IZZM (International Centre of Contemporary Music) in Carinthia. Jury member of "Jugend musiziert"